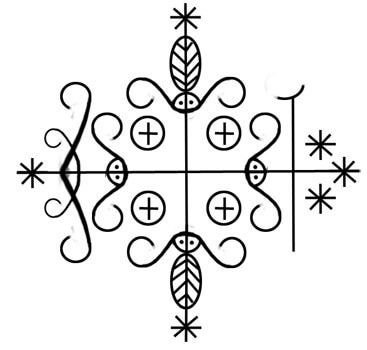 Creole voodoo is a mostly spiritual system that is based on God, spirits and ancestors. They are a monotheistic group, but God is very detached from their everyday life. Instead, spirits and family members that have passed on have a huge impact on everyday life. They interact with daily activities, and have an influence on one’s fate and fortune. Rather than view these spirits as bad, those who practice Voodoo connect with spirits through dance, music, singing, and the use of snakes (which is very specific to Creole Voodoo). To Creoles, the snake represents “healing knowledge and connection between Heaven and Earth.” Contrary to popular belief, many of the religious rituals are not open to the public, because they would be considered disrespectful to spirits and ancestors. The main focus of the Creole Voodoo religion is to cure anxieties, addictions, depression, and to help the hungry, poor, and sick. (Marie Laveau’s House of Voodoo, 2014). Voodoo dieties are called Loahs, which are very closely to related to the Catholic Saints. This is because in the late 1700s and early 1800s, almost all of the people in New Orleans, even the slaves, were Catholic. As voodoo grew, the two religions merged and have evolved into modern voodoo. This is the symbol for Damballah-Wedo, one of the gods associated with Lousiana voodo. Bamballah-Wedo is seen as a snake, which is clearly seen in his symbol. Damballah-Wedo is associated with creation and is seen by many as a loving father to the world. His presence brings peace and harmony, and he is seen as a source of life, giving water and rain. Ayida-Wedo is Damballah's partner in creation, and the creation was between male and female. Therefore, Damballah-Wedo's vevesdepict two snakes rather than just one to represent the both of them. This symbol is associated with Lagba, who is the gatekeeper to the spirit world. Many voodoo vituals start with praying to this god to other gates to the spirit world so that participants can gain access to the other lwas. The veves of these other lwas are often drawn intersecting the branches of Legba's veve to represent this. Legba is associated with the sun and is seen as a life-giver, with defines his role as the bridge between realms. For this reason, his symbol is the cross, which also symbolizes the intersection of material and spiritual worlds. Appearance:An old man who walks with a cane. He carries a sack on a strap across one shoulder from which he dispenses dentiny.